Our research focuses on the physiological responses of plants to environmental variability and resource availability. Defining these relationships contributes to a greater understanding of ecosystem processes and responses to our changing climate. We use experimental and observational studies to examine plant physiological and growth responses to water availability and changes in temperature. Typically, these questions require gas exchange measurements, sensor networks, flux towers, stable isotopic analyses, and the development of statistical and process-based models. Historically, most of our work has focused on processes in grasslands, savannas, and tree-grass interactions. 7 November 2018: Jesse gave a public presentation at the Lawrence public library regarding climate change and tallgrass prairie. This event was sponsored by the Grassland Heritage Foundation. Podcast of the presentation is available here. 14 Oct 2018: Congratulations to Seton for his first publication from his MS. Way to go Seton! 12 Oct 2018: Press release from KSU on our new Carbon Cycle Science grant!! 15-19 July 2018: Phys-Fest 2 happened at the Holden Arboretum. Thanks for a wonderful event to the Holden scientists and staff and to the amazing grad students who attended!! 19 June 2018: With Kate McCulloh, Kevin Wilcox and Lydia Zeglin, we were funded on a new DOE award to investigate changes in carbon cycling in grassland ecosystems following woody encroachment. The DOE award announcment can be found here! 2 April 2018: Rory won 1st place for the best oral paper presentation at the 71th Annual Society of Range Management Meeting, in Reno, NV. He's now a 2-time winner of this award! 18-31 March 2018: Emily and Seton are in Botswana collecting root rhizosheaths across the Kalahari. 8 March 2018: Jesse is presenting at the Savanna Science Networking Meeting in Kruger National Park. 16 Jan 2018: Marissa has began as a MS student in the lab! 14-17 November 2017: Rory and Seton presented at the America's Grasslands Conference in Fort Worth. 9 November 2017: Maddy Case from the Staver Lab joined us for a couple weeks to work in the lab. It's been great having another savanna ecologist around. 6-10 August 2017: Seton and Jesse are presenting at the ESA Annual Meeting, in Portland, OR. 2 August 2017: Liz presented her project titled "How Useful Is Fire After the Regime Shift? : An Assessment of Fire Impacts on Woody Species Following Decades of Fire Suppression" at the final REU forum. Well done Liz! 15 May 2017: Seton successfully defended his M.S. degree. Way to go Seton! 13 May 2017: Lindsey Swartz graduated from K-State with her B.S. in Wildlife Biology! 10 April 2017: Kim's recent paper in Plant and Soil is featured in the April issue of LTER Science update! 20 February 2017: Zak Ratajczak's recent paper in Ecological Monographs is featured in the February issue of LTER Science Update. 10 February 2017: Rory was awarded 1st place for the best oral paper presentation at the 70th Annual Society of Range Management Meeting, in St. George, UT! 23 December 2016: Rachel has concluded her position as SIMSL lab manager. Her next stop is Utah State to pursue a M.S. with Steve Voelker. Good luck Rachel! 9 December 2016: Kim graduated with her Ph.D. from K-State! We are very proud of you. 15 November 2016: Kim successfully defended her dissertation - "Patterns and ecological consequences of water uptake, redistribution, and loss in tallgrass prairie". Congrats Kim! Next stop for her is a postdoc at UW-Madison with Kate McCulloh. 9-13 October 2016: Rory, Kim, Ellen Welti, Lydia Zeglin, and Jesse represented the Konza Prairie at the ILTER Meeting in Skukuza, Kruger National Park, South Africa. 5-9 June 2016: Phys-Fest happened! We had ~50 amazing ecophysiologists on the prairie and it was a beautiful thing. Many thanks to all the participants, especially Troy, Kate, Chris, and Brent. 31 May 2016: The ecophys lab welcomes Mira Ensley-Field from Macalester to our lab for the summer. Mira is a Konza REU student and will be investigating the effects of browsing on dogwood physiology. 8 April 2016: Kim won 3 graduate student awards within the Divison of Biology at K-State. Way to go! 20 March 2016: Congrats to Amy Concilio as she begins a new faculty position at St. Edwards University in Austin, TX! 31 January 2016: Rory and Jesse are presenting at the Society for Range Mgt Annual Meeting, in Corpus Christi. 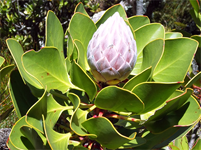 21 January 2016: Kim published her Mopane manuscript in Frontiers of Plant Science! 17 January 2016: Our REU student from 2014 - Andy Muench- published his research in the journal Plant Ecology. 12 December 2015: Rachel graduated from Biology at K-State! She is going to stick around and run the isotope lab during 2016. 4 November 2015: Jesse had the privilege of giving a 'Distinguished Ecologist' lecture at Colorado State. 1 August 2015: The lab welcomes Seton Bachle as a new MS student! 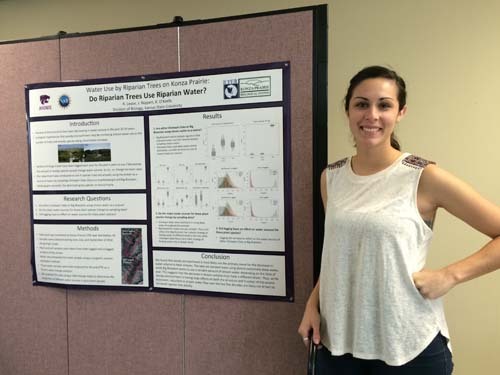 23 April 2015: Rachel presented her research at the KSU Biology Undergraduate Research Forum! 9-13 Mar 2015: Kim, Rachel and Jesse are presenting research at the 13th Annual Savanna Science Networking Meeting, in Skukuza Camp, Kruger National Park. 17 Feb 2015: Kim recieved a Sigma Xi research grant for her dissertation! 10 Jan 2015: Jesse is on sabbatical in South Africa until July 2015. He is working with Dr. Tony Swemmer at the SAEON Ndlovu Office in Phalaborwa. 13-15 Dec 2014: Jesse presented at the 2nd 'Arab-American Frontiers' Meeting in Muscat, Oman. The meeting was sponsored by the Research Council of Oman and the US National Academy of Science. 1June 2014: Andy Muench joins the lab as a REU student (from Wisconsin-Madison). 17 May 2014: We celebrate 3 graduations (and goodbyes) - Zak, Gracie and Ben are all off to bigger and better adventures! 3 May 2014: Gracie received the Haymaker Award from Biology, KSU for the top undergraduate senior. Hooray! 28 April 2014: Zak received a NSF postdoc fellowship - "Do ecological and social-ecological systems have large-scale tipping points, and can we predict them?". He'll work with Prof. Paolo D'Odorico at the University of Virginia. 15 April 2014: You can call him "Dr. Zak Ratajczak" now. Well done! 7 April 2014: Kim received a small grant from Prairie Biotic Research! 4 April 2014: Gracie received the Anderson Senior Award from the KSU Alumni Association! 15 March 2014: Rory O'Connor from BYU accepted a PhD position in our lab. Rory starts in Aug., 2014! 10 Feb 2014: Ben accepted an offer to attend grad school at U Missouri, working with Rico Holdo! 3 Feb 2014: Jesse is visiting Morgantown, WV to give a research seminar to the WVU Biology dept. 8 Oct 2013: Richard Thomas's tree-ring paper was selected as a 'Faculty of 1000 Prime Recommended' reading. 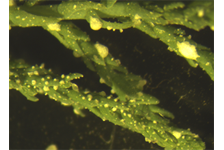 3 Sept 2013: Our work with Richard Thomas at WVU on eastern red cedar responses to changes in sulfur pollution is out in PNAS! Links to press coverage here. 27-31 May 2013: With Kendra McLauchlan, we hosted the 'Stable Light Isotopes in the Paleoenvironment' short course at KSU. 20 May 2013: Summer plans - Zak is in Stockholm, Sweden at a SARAS meeting, then on to Russia for a summer boondoggle. Gracie is in Minneapolis finding out what it's like to work for big business. 17 May 2013: Troy will join the Dept of Forest and Rangeland Stewardship at Colorado State Univ. as an Assistant Professor in August 2013! 13 April 2013: Kim won the award for best talk at the 2013 meeting of the ESA Mid-Atlantic Chapter. 25 January 2013: Kim joined the club! - getting her first paper accepted for publication in ECOSPHERE! Nicely done, Kim! 6 August 2012: The lab is off to Portland, OR for the annual meeting of the ESA. 1 May 2012: Troy defended his dissertation titled: "Growth and survival during drought: the link between hydraulic architecture and drought tolerance in grasses". The next stop for Troy is a postdoc at the U. Minny - St.Paul in the Reich Lab. 11 Apr 2012: Whitley received the Haymaker Award, awarded to an outstanding senior in our department! 25 Feb 2012: Zak's technical comment submitted to Science was accepted for publication! 18 Feb 2012: Congrats to Whitley and Drew on their engagement to be married! 13 Feb 2012: NSF News Release on our 'Critical Climate Period' paper with Joe Craine that was recently published in PNAS! 25 Jan 2012: Troy received a postdoctoral fellowship from the LTER Network Office to investigate growth resonses to critical climate periods across ecosystems, and Zak was awarded a LTER synthesis grant investigating woody encroachment and bi-stability in grassland ecosystems. 12 Dec. 2011: Gracie Orozco was selected to represent K-State in the national Goldwater Scholarship Comepetition. Nice job Gracie! 10 Nov. 2011: Whitley Jackson was accepted into the KU School of Medicine for 2012. Nice Job Whitley!